The value of saving has been preached by the leaders of both main political parties in the UK for a considerable period of time, as part of an ‘asset-based welfare’ agenda. The financial crisis of 2008 paradoxically seemed to reinforce the perceived need for individuals to provide for their own financial security by engaging intimately with the financial system through accruing private savings – and then investing the capital generated. This is despite the fact that saving, seemingly the most simple of financial behaviours, has been complexified beyond recognition, to the point, perhaps, of having become redundant as a meaningful term for understanding the financial system as we know it today. Most importantly, the transformation of banking – the rise of investment banking and securitisation, the role of ‘shadow’ banking in financing banks, and the concomitant importance of central banks in underpinning the balance sheets of private banks – means deposits by individual savers are now far less significant to banking sector business models. Policy-makers, particularly in the UK, have ostensibly sought to increase saving by other means, principally pension schemes. However, in an era of earnings stagnation, there is no evidence that quasi-mandatory pensions saving is increasing overall saving rates, since such policies generally displace other forms of saving, and there are few incentives for individuals (or their employers) to make contributions above the legally specified minimum. In practice, ‘asset-based welfare’ has always been equated with increasing levels of household indebtedness – technically, the polar opposite of increasing household saving. As such, housing-related debt is often described as if it were a form of saving or insurance – and products such as equity release, where people sell their house to fund a retirement income, help to materialise this rather odd cognitive contortion. I discuss the withering of saving in more detail in my contribution to the University of Warwick’s International Political Economy of Everyday Life project (available here). Given its ambiguous materiality, it is the moral and ideological connotations of the saving concept which have played a more significant role in asset-based welfare; proselytising the importance of responsibility and thriftiness even while the macro-economy become more dependent on debt. Since 2010, the austerity narrative has reinforced this moral economy. 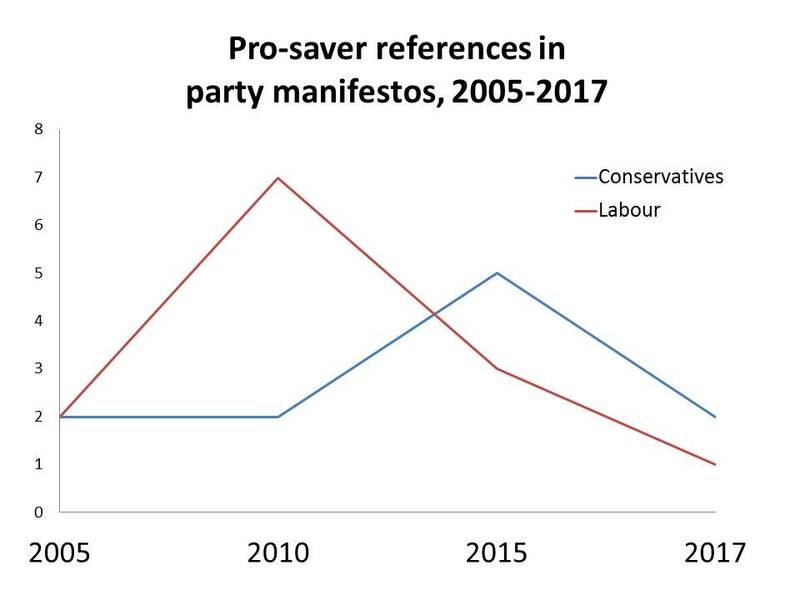 But my new British Political Economy Brief, The Declining Salience of ‘Saving’ in British Politics (available here) presents evidence that even the discursive force of saving may be waning in the UK. 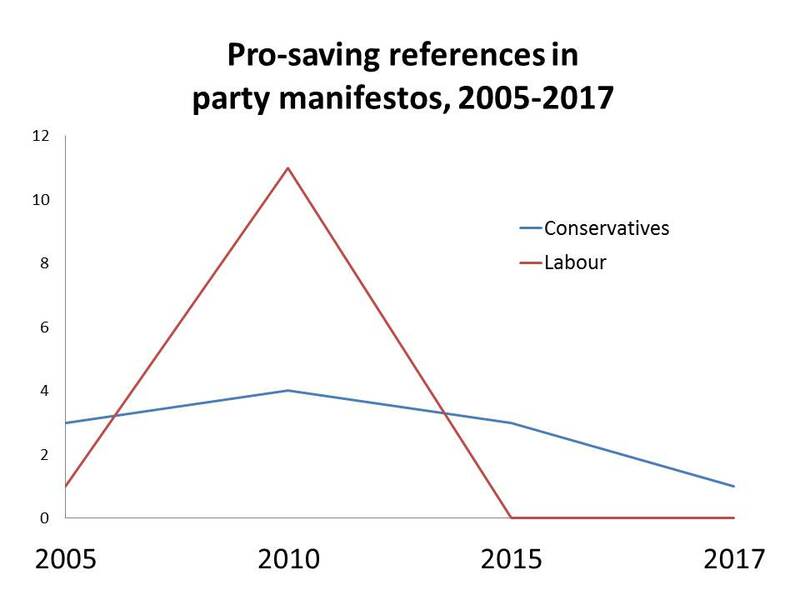 The Brief presents evidence on the different ways in which saving was discussed in the manifestos of the Conservative Party and Labour Party at the 2005, 2010, 2015 and 2017 elections. In 2015, the Conservative manifesto contained a significant number of positive references to savers, in terms of protecting or rewarding savers as a specific category of voters. By 2017, there were far fewer such references. The last time that a main party manifesto included significant reform of social care finance (Labour in 2010), the document was adamant that the new system would protect, rather than utilise, people’s savings – despite the fact that the proposed policy was not dissimilar to that proposed by Theresa May in 2017. Accordingly, while positive references to savers featured in the 2005 and 2015 Labour manifestos, this discourse spiked in 2010 – many of these references were linked to attempts by Labour to connect its action in the wake of the financial crisis to the protection of savers’ accumulated wealth. By 2017, however, positive references to savers had almost entirely disappeared from Labour discourse. References to supporting and encouraging the act of saving, including policies designed to incentivise saving, were a permanent feature of the Conservative Party’s 2005, 2010 and 2015 manifestos. In the 2017 manifesto, in contrast, there was only a single pro-saving reference. In terms of Labour’s pro-saving discourse, having barely featuring in the 2005 manifesto, Labour’s 2010 manifesto contained a very large number references to supporting or encouraging saving – many of these references were connected to Labour policies in this area focused on enabling saving by low-income households. Remarkably, this pro-saving discourse had entirely disappeared by the time Labour’s 2015 manifesto (there were also no pro-saving references in the 2017 manifesto). The Brief also charts the connections made in manifestos between the discourse on saving and other economic activities. The Conservative Party has consistently connected its discourse on saving and savers to pensions provision, retirement and population ageing (with little discernible change between the Cameron and May governments in this regard). The connection between saving and pensions was also an important feature of Labour’s 2005 and 2010 manifestos, particularly 2010 as the party associated its discourse on saving with the introduction of ‘automatic enrolment’ into workplace pension schemes. As noted above, however, Labour’s 2015 manifesto contained no pro-saving messages. Its references to pensions generally instead offered a pro-saver message, insofar as the party vowed to protect savings that had already been accumulated from high pensions management fees. Remarkably, despite a lengthy section on pensions provision, including a paragraph on workplace pensions which echoed the 2015 agenda, Labour’s 2017 manifesto made no connections between pensions provision and the act of saving. The Conservative Party’s 2015 manifesto made several connections between saving and purchasing a home. This discourse undoubtedly relates to the coalition government’s attempt to stimulate the housing market in order to trigger an economic recovery (there were no such connected references in the 2010 Conservative manifesto). But this discourse had largely fallen away by 2017. The saving/housing link had never been a significant feature of Labour manifestos. Indeed, the 2015 manifesto introduced a negative connection between saving and housing, by proposing a requirement that would have seen ‘the billions of pounds saved in Help-to-Buy ISAs [a scheme introduced by the coalition] invested in increasing housing supply’). Interestingly, most recent main party manifestos have neglected to highlight the (potential) macro-economic significance of saving by individuals. The Conservative Party’s 2010 manifesto, however, contained a large number of references to saving in relation to economic ‘rebalancing’, insofar as saving would enable more private investment. Yet this discourse had entirely disappeared by the time of the party’s 2015 manifesto – as references which instead connecting saving to the housing market spiked. It is worth noting, finally, that Labour’s 2017 manifesto encompassed a significant emphasis on increasing private investment – but without making a single connection between investment and saving by individuals or households. The positive discourse on saving which has been a significant feature of British political discourse since at least the mid-2000s has now largely disappeared. It is worth reiterating that this discourse was most strongly promoted by the two main parties at slightly different times: Labour in 2010, and the Conservative Party in 2015. It is telling that both parties were in government rather than opposition at the time, insofar as this suggests that asset-based welfare is an endemic feature of British economic statecraft, irrespective of which party is in government, and irrespective of what parties say while in opposition. But the 2017 general election appears to have signalled a significant shift. Whereas Ed Miliband’s 2015 agenda can now be seen as an important ‘gateway’ between New Labour and Corbynism, the shift in Conservative discourse has been more abrupt. However, we should be careful before declaring the onset of a new era in economic statecraft around saving; neither party won a majority at the 2017 election. It is possible that both parties – particularly the Conservatives – will revive a positive discourse around saving in order to reassemble a compelling electoral offer. Asset-based welfare is down, but not necessarily out.